Islands was like a breath of fresh air. Who ever said there’s no heaven on earth, has never sailed the British Virgin Islands. 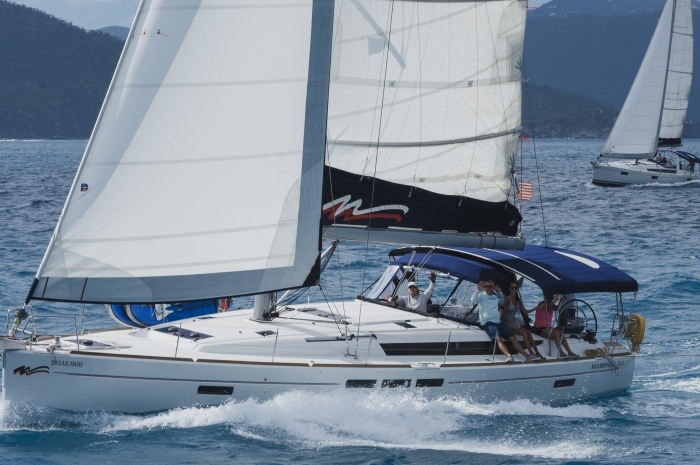 Offshore Sailing School graduates and friends set sail on four Moorings 48’ and two 51’ sailing yachts. 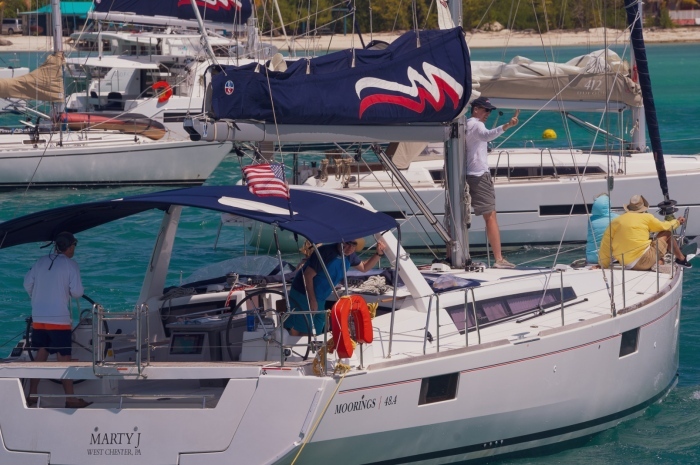 Our “mothership” for the week would be a Moorings 51’ Power Catamaran, with enough space to host our group of 40 for parties aboard. 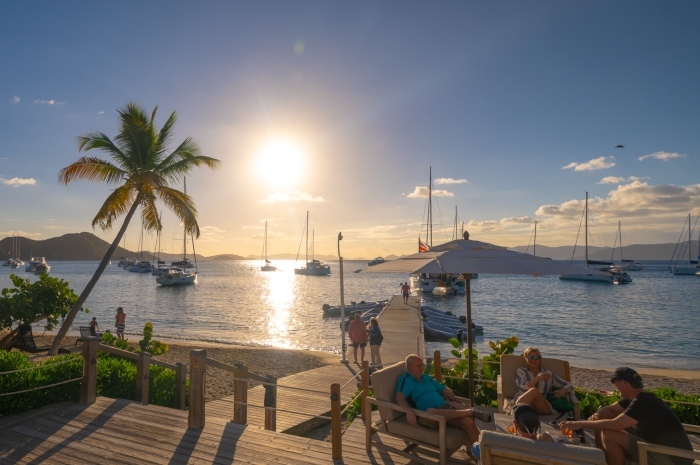 Offshore Sailing’s Chief Operations Manager Bryce Jackson and his wife Victoria, and Offshore’s Caribbean Manager, Folkert “Dutch” Jongkind co-hosted this special “Insider’s Guide to the BVI.” Dutch is well-known in these parts, so we knew we were in for a treat. 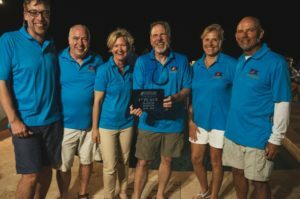 The flotilla kicked off Saturday, February 23rd with an introduction meeting in the lobby at The Moorings base on Tortola, BVI. After meeting everyone, we headed to our boats to check our provisions. In the early evening, we had a lovely meet and greet party that ended with a wonderful dinner! This would be an early night because the next morning, we would set sail for Cooper Island. 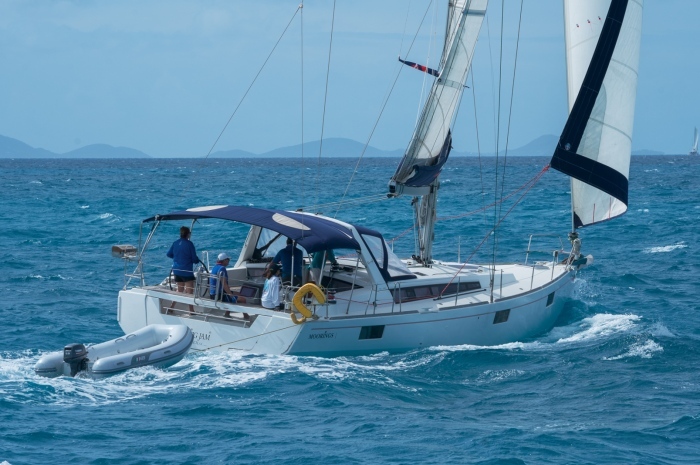 After taking care of a few things at The Moorings base, we topped off our gas and water tanks and headed to Cooper Island around 11:30 a.m. We had a nice sail from Tortola to Cooper where picked up mooring balls. 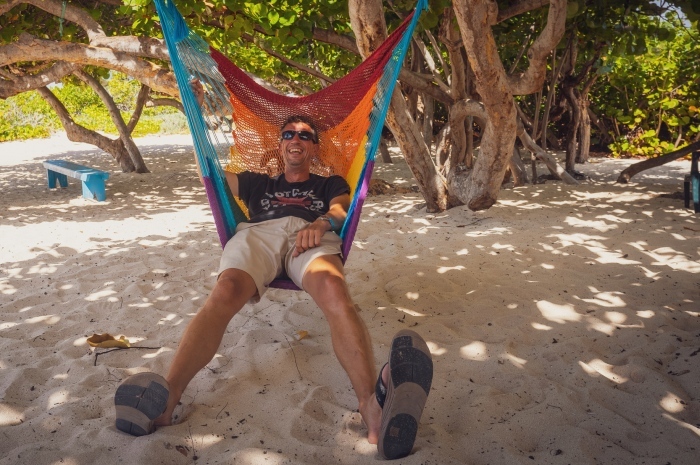 Once on the hook, we had the opportunity to chill-lax on the beach, explore the island, or take our dinghy to little Salt Island for some awesome snorkeling and a beautiful hike looking out over the islands. We ended the day with a private rum tasting at the world-famous Cooper Island Beach Club’s Rum Bar. Having the opportunity to taste 35-year-aged rum, or some solar-powered brewed beer while watching a breathtaking sunset, was simply spectacular. taxi ride to The Baths national park, which is one the most awe-inspiring places on earth. A group of us decided to take this route and realized half way down the trail we had made the right choice to explore The Baths. With boulders at least 40 feet tall, lots of small caves to explore, seeing the beautiful, clear water, and climbing on some rocks, we were satisfied. It was wonderful seeing the unique geologic formations. After an invigorating hike and swim at The Baths, we ended the day with Captain Bean’s famous pirate show at Leverick Bay where people laughed and sang along to classic pirate songs. 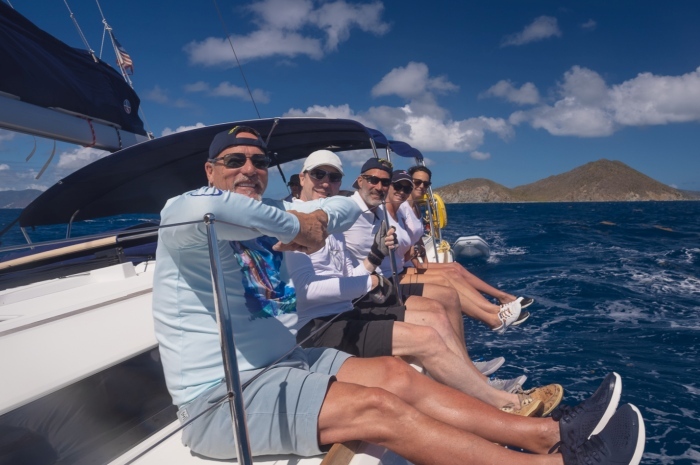 After a night of rum tasting and singing pirate songs, we attended the skipper meeting at 8 a.m. Our plan for the day was to have a practice sail race over to Anegada to explore the flat island. We set sail around 9:30 a.m. and arrived around noon. Once everyone anchored or picked up a mooring ball, we set off on our island adventure. We had the opportunity to rent bikes, scooters, cars, and even horses. We chose to rent a car for a small fee to get us around the island. Our first stop was the famous Faulkner House Museum, where Faulkner played a vital role in establishing a Constitution and a new Legislative Council in 1949. He is known as one of the “Fathers of this Little Nation.” After we got our history lesson, it was time to seek refreshments. We headed to Big Bamboo at Loblolly Bay where we had a nice cold Carib and relaxed on the beach where Offshore Sailing co-host Bryce Jackson found a handful of small, colorful shells. From Big Bamboo, we drove past Anegada’s tiny international airport, turned down a tiny dirt road that was along the shore of Anegada’s famous Salt Lake where people can spot flamingos. Unfortunately, we didn’t spot any of the intriguing pink birds, so we continued onward to the Anegada Beach Club. 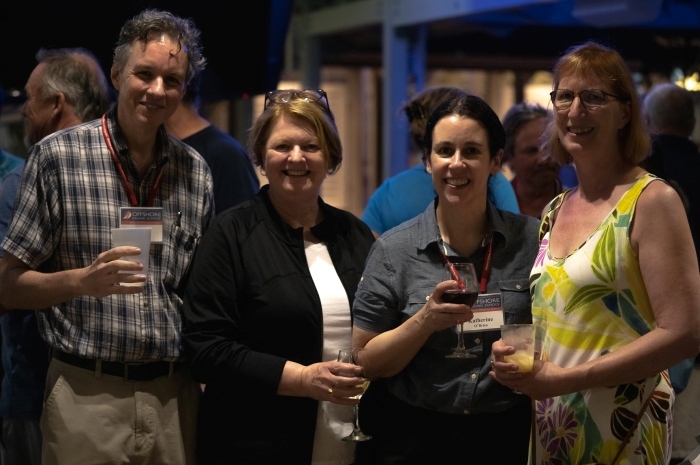 After some drinks at the tiki bar, we ran into some fellow graduates on the flotilla and had a wonderful time! Our last stop for the day was Cow Wreck Beach, where we played a game of billiards on a slanted table right on the beach. The next round of drinks was on me since I lost. 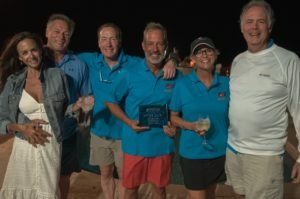 After a full day of exploring Anegada, our great flotilla leader Dutch had set up a wonderful lobster cookout right on the beach at The Lobster Trap restaurant. After a satisfying meal in this beautiful beach setting, we ended the night with some drinks and dancing. fritters, we made our way back to the mothership for more libations and revelry with the whole crew. After enjoying Painkillers made by Bryce’s lovely wife Victoria, everyone dinghied to their respective boats for dinner aboard. With what little energy we had left, we knew we could rise to the occasion for a nightcap at the fabled Foxy’s, and some of us even stayed for the dancing, despite knowing that we had one more day of racing. On the last day of the Regatta, anticipation was high. During the 8:30 a.m. skippers meeting, a lot of smack-talk began among each boat. Setting sail at 9:30 a.m. for a race start at 9:45 a.m., we raced downwind to Guana Island. 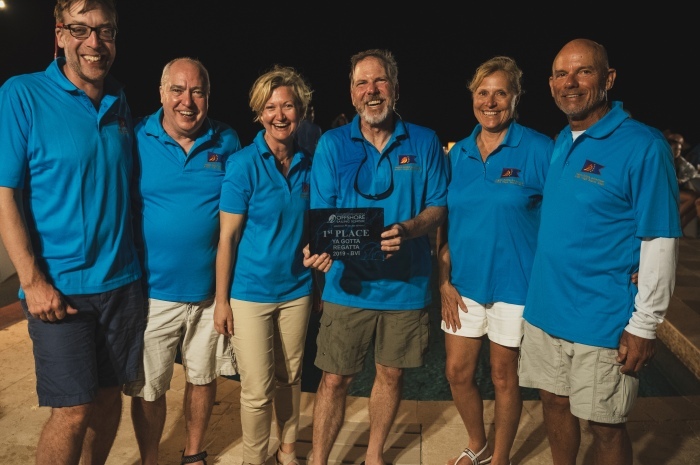 Arriving around 1 p.m., the boat “Marty J” crossed the finish line first, for the second day in a row, taking home the 1st place trophies. Once all the other boats crossed the line, we all anchored off the shore of Island for a nice, refreshing swim. Island Resort, Spa and Marina, an exquisite Marriott Autograph Collection resort on private Scrub Island. Since it was sadly the last night of our Flotilla, we took a group photo on the steps in the marina. We were all eager to explore the natural beauty of this “secret garden” island. We took an exhilarating “taxi” ride on hairpin “roads” neither of those being quite typical to traditional settings. We happily arrived at North Bay for our final dinner celebration. We started off having a nice cocktail hour watching a beautiful sunset for one last time. Then the fun and attentive staff at Scrub Island Resort set up a huge bonfire for us while we ate a delicious Caribbean meal around the pool on this pristine beach. Halfway through the meal we were surprised by Moko Jumbie Dancers on stilts who put on a show. After that wrapped up and everyone finished eating, Bryce emceed the Regatta Award Ceremony. Since we had two teams tied for second place, we had a trivia competition for a second-place winner. No one got the correct answers, so the game continued. The group took a vote between karaoke and talent show format for the tie-breaker. Everyone loves karaoke so the challenge was set. The “Break Away” crew chose Sweet Caroline by Neil Diamond and “Fig Jam” crew chose Walking after Midnight by Patsy Cline. After two entertaining renditions, everyone voted for Break Away’s Sweet Caroline rendition. The ceremony continued with “Marty J” getting their first-place trophy, followed by Break Away in second place and Fig Jam in third. Once the awards were distributed, the party continued. 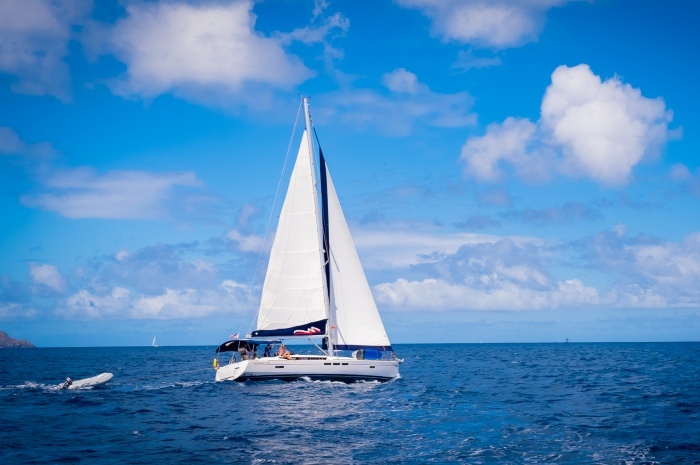 Everyone on the trip all sang along to Come Sail Away by Styx and laughed and cheered for one last night of fun before having to return the boats to The Moorings base on Tortola. Once the party wrapped on North Beach, everyone was shuttled back to Scrub Island Resort, where we were greeted by a beautiful marina scene. 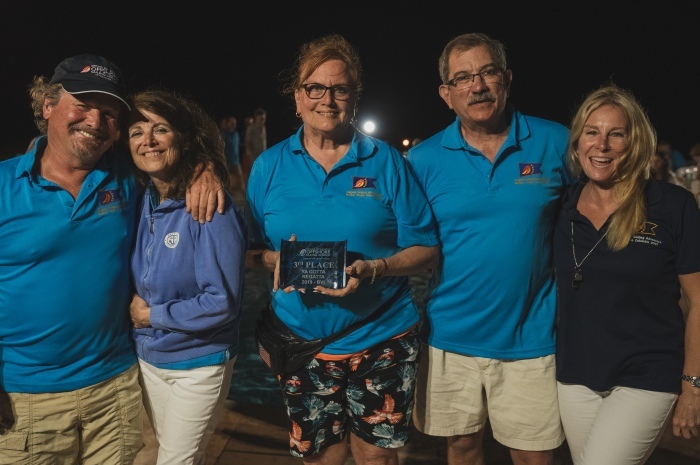 After sunset, the resort turns on colorful lights on the docks to illuminate the many different fish, from tarpon to sting rays, and even nurse sharks. It was a wonderful conclusion to an amazing trip. 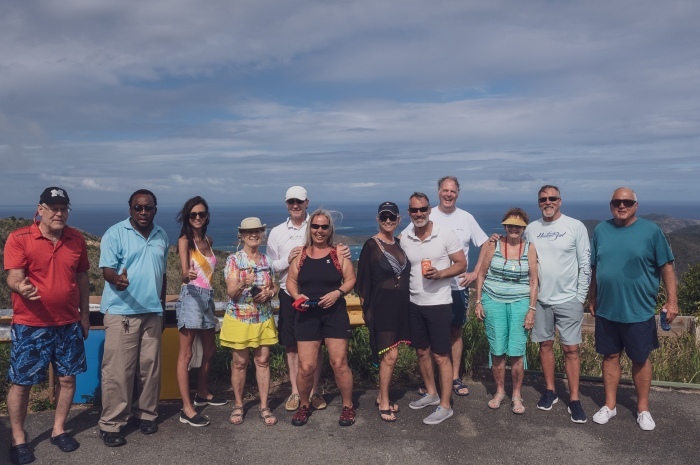 Still basking in the glow of last night’s revelry and lighted fish display, we sadly bid farewell to new friends from the Scrub Island Resort and set sail for Road Town on Tortola. We got to know so many interesting and fun people on this flotilla vacation. 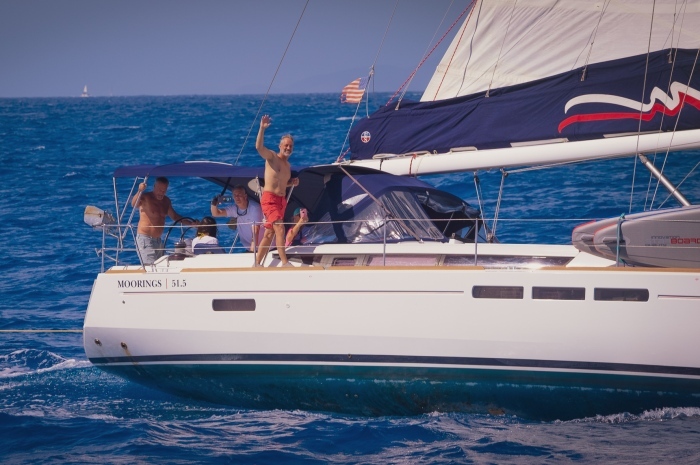 Back to reality for now, but we’re already planning our next flotilla for late summer in Croatia!